A creative Prezi presentation template for creating an interactive questions and answers round. 3D scene with classic white flashcards lying on a wood table. Add a question or word on the cover of a card and zoom in to reveal the correct answer. A good presentation template for asking questions from the audience and keeping the viewers engaged. Use it as an aid for studying or preparing for an exam or school test. A multipurpose Q and A template for any kind of presentation topic. Everyone loves answering questions, especially in front of a large audience! 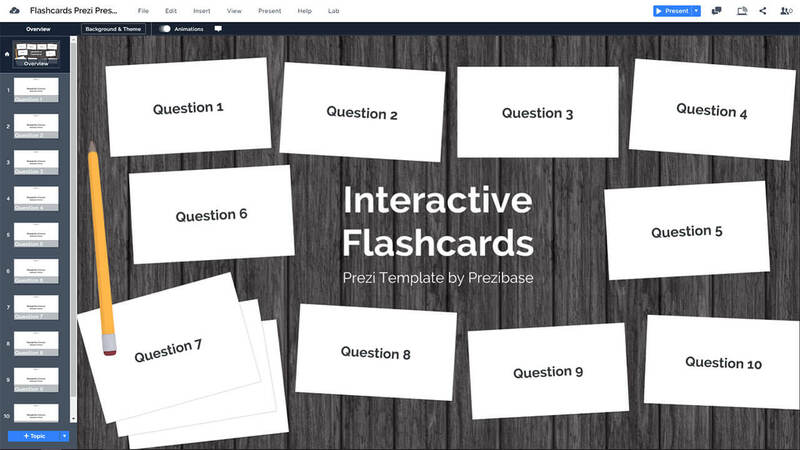 Here’s a great chance to test your audience with a public presentation or on online test – a Prezi Next Presentation Template with a flashcard design concept. The presentation starts with overview of multiple scattered cards lying on a wood desk surface. The overview also includes a large text placeholder for your title in the middle. 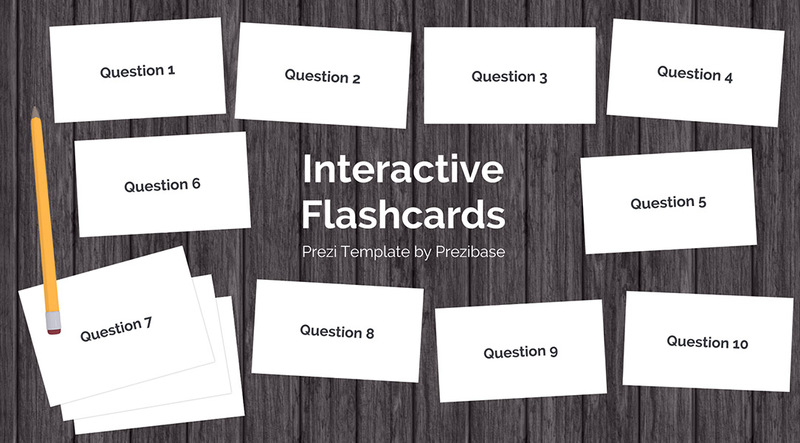 This template uses one of the best features of Prezi Next, which means you don’t have to follow a slide order – simply point onto a question or card and click to zoom in to reveal the correct answer. This entry was posted in Best Prezi presentation templates, Prezi Next Templates and tagged alphabet flash cards online, baby flash cards online, education, flash cards, flashcards, flashcards online, flashcards online addition, flashcards online and app, flashcards online anki, flashcards online best, flashcards online buy, flashcards online free, flashcards online games, flashcards online maker, flashcards online math, flashcards online printable, flashcards online study, flashcards online with pictures, flashcards presentation template, interactive flashcards online template, learning, lessons, online anatomy flash cards, online flashcards and quizzes, online flashcards animals, online flashcards ap, online flashcards audio, online flashcards template, prezi next template, prezi next templates, Q and A, QA, question cards, questions answers, school, teaching, visual learning tool.